We have underestimated the differing number of combinations and interactions with the Assistant release for the Self-consumption Hub-2 v3, as originally detailed below. It has been released too soon, which has caused several issues and I wish to personally apologize for that. A number of the problems are already fixed. Further fixes are being implemented and a lot of testing is being done as we speak. The Assistant has been updated just now (late Friday), and it is now clearly marked as a Beta release. Please use this beta to improve systems that have already been configured with the hub-2 v3 Assistant. I recommend to wait a bit if using it on new installations, as it is quite certain that you will need to update anyhow in the coming weeks. We will inform you here, just as soon as we can, when all issues are solved. – Absorption was always skipped, except during a maintenance charge of course. Now it is only skipped when connected to the grid, and when feeding back to the grid is allowed. 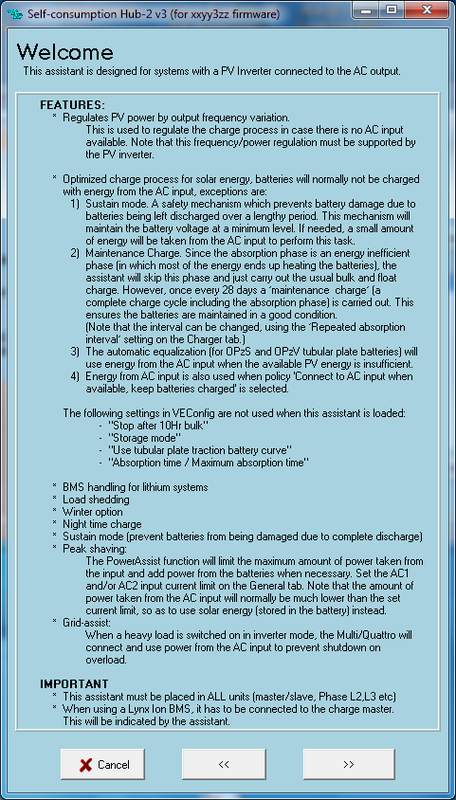 In other words: it will always use the available solar energy for absorption, when in inverter mode. – In some situations the system would keep inverting, instead of switching to the grid, and the other way around. 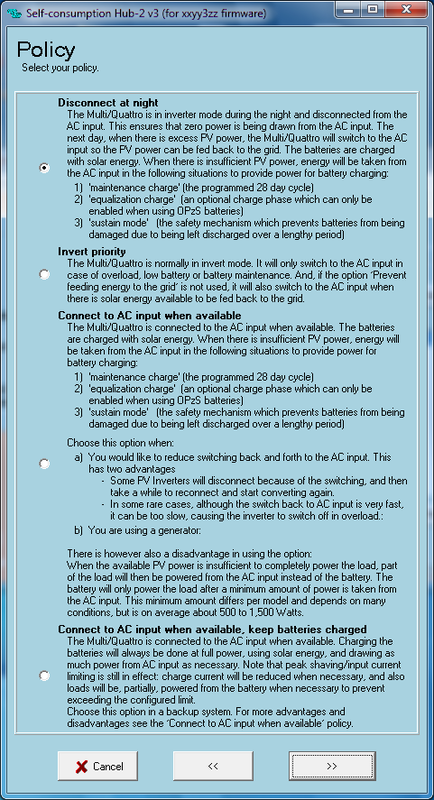 – If the battery voltage drops below the pre-alarm level, because of a high load in combination with grid assist, the state of charge is falsely set to a minimum, which activates the ‘low SOC recovery’ mechanism: loads will temporarily be powered from the grid, the battery will be charged from PV only, low battery alarm LED is blinking. The low SOC recovery mechanism stops when the state of charge reaches the release condition. The default release percentage varies per battery type, and is between 30 and 60%. A major overhaul of our self-consumption Hub-2 assistant is now complete. It is available for download using VEConfigure3, as of last night. The two wiki pages above are new and still being improved every day. There will be more information about this in a future blog post. Now, back to the updated Hub-2 assistant. The new welcome screen is shown below. Read it, and the policy selection screen below, carefully to learn about all the options and features. 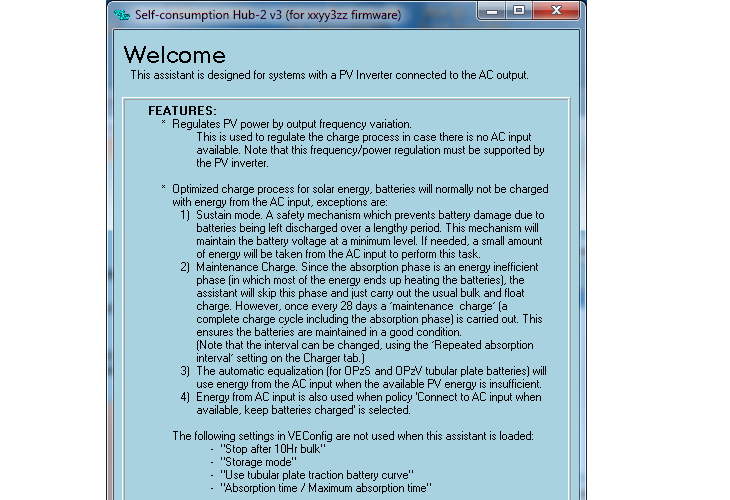 With these new policies, the old PV Inverter support assistant has become almost obsolete. Improvement: Sustain mode does not pulse-charge any more. Improvement: Less PV power is fed back to grid whilst charging the battery. In the previous version this leakage was minimum 50 to 200W per unit. Now it is almost zero watts. New option: Prevent feedback to the grid. New option: Make use of an off-peak or night tariff. New option: Winter mode. Connect a simple toggle-switch to one of the digital inputs. When switched to winter mode, the battery will be kept fully charged, and the loads are powered from the grid, and of course PV power when it is available. New policy: Connect to the mains when available, keep batteries charged. Use this for a PV-powered backup system, where you want to keep the batteries fully charged in case of a power outage. The Multi or Quattro needs to have the new microprocessor: Make sure that the 7 digit firmware version number, as written on the microprocessor, starts with 26 or 27. Old, and therefore incompatible, Multis and Quattros have a firmware version starting with 19 or 20. We have a swapping program for recently installed units that still have the old microprocessor. Contact your Victron representative for more information. The firmware of all units in the VE.Bus system needs to be upgraded to xxxx302. See our PDF VE.Bus firmware versions explained for more information and instructions. Note: Besides these new developments, much time and energy has also been invested in the texts and explanations in the assistant pages. Covering all the possibilities in easy to read text is not easy! Nonetheless, if you have suggestions for improvements, please let us know via the comments below.